Why Does The Edible High Last So Long? There’s still a huge learning curve for consumers of edibles when it comes to dosage control – and an enjoyable, well-timed edible high. If you’ve ever dabbled in medicated foods, then you know the edible high can be intense and long-lasting – definitely much more so than smoked or vaporized flower. Luckily, regulations in many legalized states are setting upper limits on the potency of edibles and the way they are portioned and packaged. But there is still a huge learning curve for consumers of edibles when it comes to dosage control – and an enjoyable, well-timed edible high. When it comes to how the body breaks down THC, inhalation and ingestion differ greatly. You simply have to know this if you want to take control of your consumption and the effects you feel. When you smoke or vaporize cannabis, it enters the bloodstream directly through vessels within the lungs. There’s no need for the THC to pass through the digestive system. This means that the effects will hit you almost immediately, and will usually subside in the span of 4-6 hours. Imbibing an edible is a whole different story. In this case, THC moves through the entire digestive system. 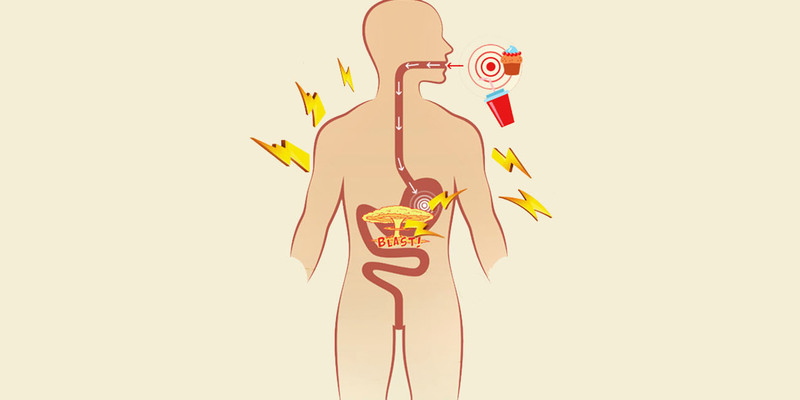 This means there are many metabolic factors that contribute to the way you feel after consuming. A standard starting dosage for edible THC is 10mg. When you consider that most consumers of edibles aren’t aware of this and that many manufacturers of edibles do not follow this rule of thumb, you can guess why extra-long and intense edible high stories are so prevalent in our culture. THC from ingested cannabis is slowly processed through the mouth, stomach, intestines, and finally the liver, where it eventually does make it into your bloodstream. However, the resulting effects depend on many factors that are so often overlooked by new or inexperienced users. Taking an edible while dehydrated or on an empty stomach will likely cause the THC to hit your system all at once, making you incredibly high. On the contrary, eating THC after you’ve already eaten a meal will generally cause a delay in the edible’s metabolism. That means you might not feel high for a few hours, and the strong effect can last as long as it takes for your food to break down completely. Depending on the natural speed of your metabolism, it could be awhile until the effects of an edible go away. During this time you might have some serious trouble tending to your daily routine or even staying awake. You may experience heavy sweating, dry mouth, trouble breathing, or even anxiety and panic due to the high levels of THC in your system. The length and intensity of your edible high can also be affected by prescription medications or supplements that you are on. That’s why it’s always a good idea to chat with your doctor about how your metabolism could be affected. Another reason the edible high lasts so long is because the body creates different THC-by-products based on the method of consumption. When inhaled, delta-9-THC remains unchanged. It simply passes the blood-brain barrier and gets you high instantly. However, when eaten or drank, delta-9-THC breaks down to become 11-hydroxy-THC, a faster acting and more psychotropic form of the chemical. In other words, once your tasty edible has been digested, it’s essentially become a super-powered form of cannabis that’s totally different from what you’ve encountered through smoking. Stronger highs and even hallucinations have been recorded. The resulting 11-hydroxy-THC has the potential to remain inside your body for up to a day, but the internet reveals even scarier anecdotes of people who have been crazy high for up to three to five whole days. Take that as a warning to be careful with edibles! It’s important to remember that safety comes first with cannabis. Whether you’re using it for medicinal purposes or just to have some fun, educate yourself. Start with a reasonable edible dosage you know you can control, typically 25mg or less, and add more later if you don’t feel amazing. This will help you build up gradually to your desired effect, rather than getting it all at once or over a multiple-hour span. Start small and smart with edible cannabis products. After all, you don’t want your friends to be making fun of your edible horror story for years to come. If you want to try making your own cookies or other edibles, try the LEVO Oil Infuser.